Fresh-baked bread has only one fatal flaw: the loaf almost always seems soft and under-baked when it first comes out of the oven. Don't rush into popping it back in just then. Let it cool for at least 20 to 30 minutes, and then decide if it needs more time. 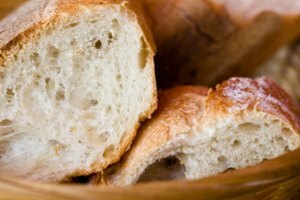 Which Types of Bread Re-Bake Well? Rustic breads like pizza crust or flatbread actually improve when baked again because they're meant to be crisp and chewy. Soft yeast breads might not fare as well—they can become dry, especially if you've already cut into the loaf. Quick bread generally turns out fine if you bake it again, but if the loaf fell in the center because it was under-cooked or lacked leavening, re-baking won't fix the problem. To re-bake bread a bit longer, place it in the original pan and back in the oven at the original temperature. Bake for an additional 5 to 10 minutes, or just until golden brown and cooked through. 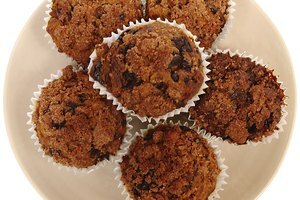 Quick breads like pumpkin or banana are done when a toothpick inserted in the center comes out clean, with just a few moist crumbs. 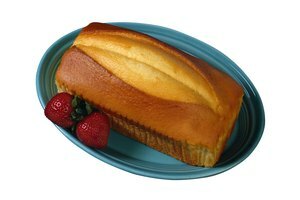 Yeast breads are done when the tops are golden brown and the bread makes a hollow sound when tapped. For the true test, insert a meat thermometer into the center of the loaf. Lean breads like French bread are ready when the thermometer reads 205 degrees Fahrenheit. Rich loaves that contain eggs should be 185 to 190 degrees Fahrenheit. Aluminum pans cook evenly and quickly, while dark metal pans may burn bread. Turn the oven temperature down by 25 degrees Fahrenheit if you use dark metal or glass pans. Bake bread on the middle rack and don't overcrowd the oven. 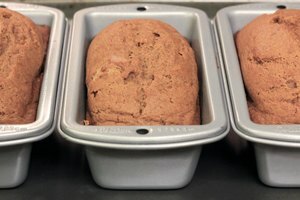 One or two loaves is about all most home ovens can handle at once. If you removed the bread early because the top was getting too brown, try turning the oven temperature down slightly next time. Lower the rack the bread sits on, or place a piece of foil loosely over the bread to slow browning. 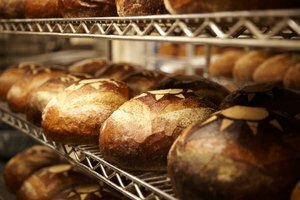 If your breads are consistently underdone, a faulty oven thermostat may be to blame. Oven temperatures can be off by as much as 50 to 100 degrees Fahrenheit, which can make a big difference in baking. Use an oven thermometer to check accuracy. If you're going to re-bake under-cooked bread, do so within two hours of removing it from the oven. After this time, bacteria from raw eggs in the bread can multiply and may cause food-borne illness. Bread In 5: Underbaked! My Loaf Didn't Bake Through to the Center!